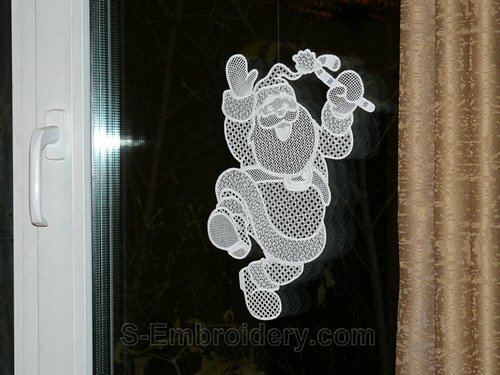 With this freestanding lace Santa Claus machine embroidery design you will create an interesting Christmas window decoration with a a size of approximately 10 x 13.2 inches (257 x 340 mm). 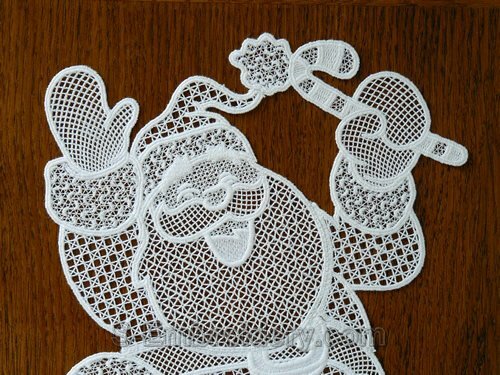 The free standing lace ornament is split in 4 parts that can be stitched out in a 5x7 (130 x 180) hoop. The parts are easy to put together, using machine stitches. 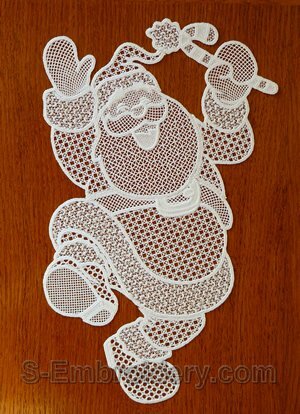 The largest part is 4.98 x 7.02 inches (126.4 x 178.3 mm) and has 50,322 stitches. The smallest is 3.82 x 3.44 inches (97.1 x 87.5 mm) and 14,280 stitches. You receive 4 machine embroidery files in one of the supported formats and 2 PDF files with design information and instructions.